Yesterday, Amazon CEO Jeff Bezos announced the Kindle 2, the second generation of the company's surprisingly successful electronic reader. 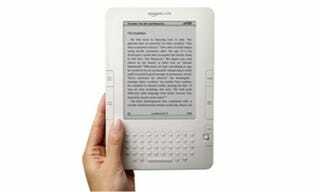 Like the first-generation Kindle, the new device can download newspapers, magazines, blogs and any of the 230,000 books available in Amazon's Kindle store, all via wireless technology that uses a free-of-charge cellular phone network. Special features of the Kindle 2 include a longer batter life, faster loading, more storage, a slimmer design and a text-to-speech function. The price is still high—$359, at present—and some aspects of the device's design remain clunky. Also, the Kindle 2's screen is still in black-and-white, not color—although anyone who's used a Kindle can attest to how vivid and print-like that black-and-white screen looks. The real question with the Kindle 2—due to be released on February 24th—is whether a big enough market exists for an expensive electronic reader with limited functionality, or if the Kindle's thunder has been stolen by the iPhone and iPod Touch, which offer highly serviceable readers alongside a host of other goodies. (Also, one has to wonder whether everyone who really wanted a Kindle already bought one the first time around.) But given that the future of reading appears to be in portable electronic devices, not print, the Kindle still appears to represent the technology's cutting edge.